Purchased and sent an overnight Next Day Air Letter from CT to Brooklyn NY (time sensitive stock transfer Notarized document that can't be emailed or faxed). Dropped off at a letterbox in Vernon CT at 4:30 pm with the last pickup time of 5:30 pm with plenty of time to spare. Next Day Air Overnight deliver is supposed to be completed by 10:30 am the following morning. Even with 'inside' information I had no clear idea what the message meant - The receiver has requested that we hold this package for a future delivery date / Delivery will be rescheduled. My husband immediately got irritated because the message is completely misleading. 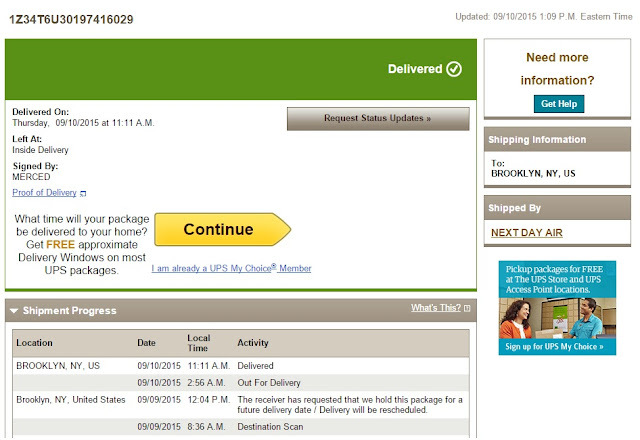 I even contacted the receiver on the off chance they requested a 'future delivery', which they did not. So what does it mean? I could be one of a couple of situations - the driver was late delivering and 'dinged' the package to keep up the numbers/productivity, the package was not on the delivery truck to make it to the destination or the package was 'misplaced'. 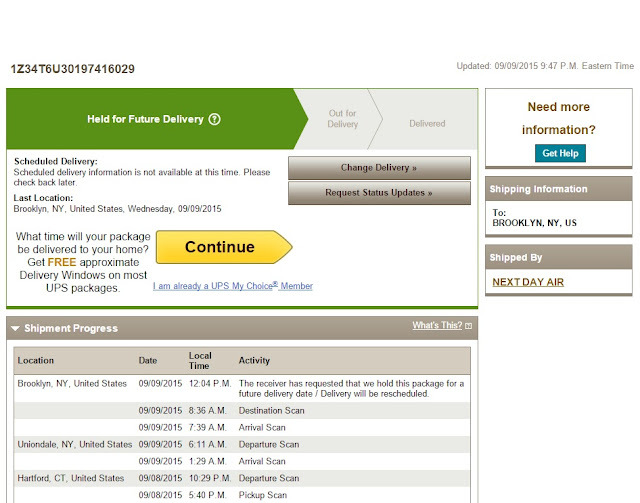 I placed a call to UPS customer service shortly after 1 pm on 9/9/15, spoke with someone who checked the tracking number and confirmed that they will attempt to re-deliver the same day and promised a call back 'within the hour' to verify that it's being re-delivered. By 6:10 pm I was getting irate that there were no calls, email or updates on the tracking information and called again. This time I was told that a re-delivery will be attempted but I pointed out that the destination is an office building that would now be closed. I asked why it was not re-delivered 5 hours earlier after I called the first time as promised and why there was not call back. No helpful answer was provided but another promise made to re-deliver. I pointed out that the business is now closed so it would be attempted in the morning. Frustration had built up at that point to such a level that I posted a message on UPS Facebook page and received a reply within 6 minutes with an email address where to direct the details for further assistance. Email sent to the provided address outlining the timeline and the repeated fails at delivering my Next Day Overnight Letter. At 7:20 pm a reply was received from customer service that they have escalated this issue to the local facility's Management team. At 7:24 pm we receive a call from a member of the Brooklyn NY hub management team, sadly I can't recall the woman's name, she initially spoke with my husband and when he said he had an idea what happened to the package she proceeded to insult him by saying 'you don't know what you are talking about' even after he told her that he's been a UPS driver for 25 years. I took over the call at that point because I saw the steam gizers exiting his ears. I explained the situation but she was not only short with me, when I asked the question 'do you know where the physical package is right now' she yelled at me that I cut her off and repeated to me the same thing we heard earlier in the day. That the package was attempted to be delivered, I was suspicious that it was a fact and called her on it. If the package was in the truck and was delivered, even after the 10:30 am deadline, then there would be tracking update and it would be in the mailroom of the recipient but none of that was true. So that leaves the fact that it was never on the truck, I said that exactly at which point she reluctantly conceded. I pointed out that it would be best to provide that in the tracking information rather than some bogus message making is sound like the delivery was declined. It was an unpleasant interaction during which I had to bite my tongue not to swear up a storm. So the package has at least has been physically located and scanned at 2:56 am, great, one step closer to being delivered. DELIVERED! Albeit late at 11:11 am instead of by 10:30 am, 24 hours + late. Now I have to wait for the call from Customer service after 3 pm to discuss a refund since we paid $28 for the overnight delivery which was not done. The manager I spoke with the night before said that they would have to research the situation to see if there is any potential refund coming to us. Way to stand behind your own deadlines and service. No call back on 9/10/15 so I called Customer Service to start the refund process, got a bit of a run around that the refund would not be full amount paid and could take 1-2 credit cycles. Not sure why payments can be made practically instantaneously but credits could be up to 2 months. Now I'll be checking my account to see just how long it takes to have the refund hit my PayPal. Overall this was a disappointing experience that I don't wish to relive anytime soon. Ironically we could have driven the package to Brooklyn in 2 hours instead of 25 hours it took via UPS. We never expected or wanted any preferential treatment being a UPS employed family but I was genuinely surprised that progressed the way it did. I felt insulted and dismissed by customer service when placated by promises of call backs and timeframes that were not met. Business needs to learn that if you have any doubt about being able to keep a promise, don't keep repeating it. If you find that a human error was made, admit it instead of covering up with none sense messages and certainly don't tell a customer that they don't know what they are talking about. Now I have a daily task of keeping track of when the refund will hit my PayPal and will update it in this post. Have you ever had a poor customer service experience where you felt ignored or overlooked? How did you address it? I'd love to hear your stories. 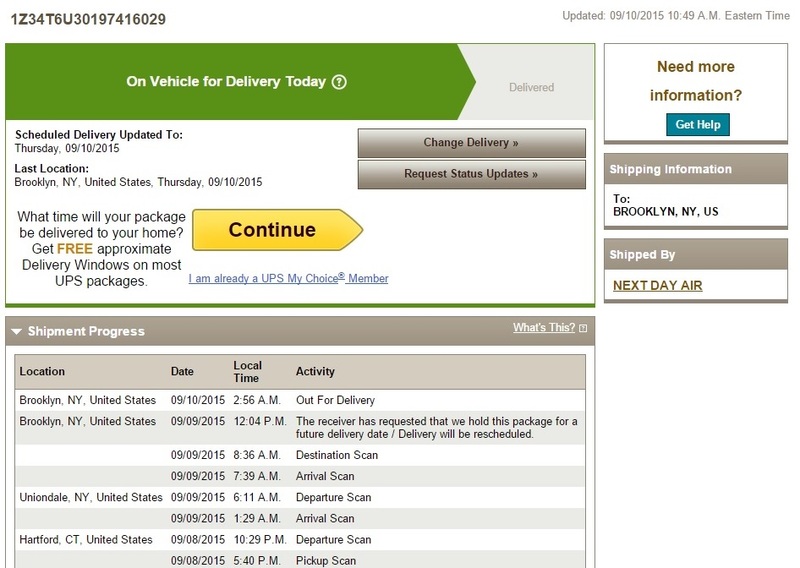 On September 19th, UPS credited my PayPal account $27.40 (original cost was $28.43) without an email or promised follow up. Pretty sure they just wanted to get me off their back and done with. So 10 days for the refund is definitely better than the potential 2 billing cycles I was notified of before. My father worked 40 years for the post office. I used UPS for large packages only, for things I need there fast I use FedEx, small packages and letters I use the post office. Granted Post Office express and priority mail cost more but If I need it there the next day I get it signed receipt requested. Hope this helps, Never send a letter UPS. Sounds so much like what I went through with Staples. They must train their customer service personnel from the same manual. Good luck with the refund!